Home » VectorVest » Buy Warpaint #W7L says VectorVest. Fundamentals and technical picture add up to an exciting growth prospect. Buy Warpaint #W7L says VectorVest. Fundamentals and technical picture add up to an exciting growth prospect. By Alan Green in VectorVest on 19th June 2018 . Warpaint London Plc (W7L) is a colour cosmetics business, based in Iver, Bucks. It is made up of two divisions: close-out and own-brand. The second and larger own-brand division consists primarily of the Group’s flagship brand, W7 – an extremely creative, design-focused cosmetic brand proposition with a focus on the 16-30 age range, delivering high-quality cosmetics at affordable prices. The W7 brand has grown organically since its inception in 2002 and now contains over 700 items which are sold into high street retailers and independent beauty shops across the UK, Europe, Australia and the US. In 2017, W7 was supplied in more than 60 countries. In 2017 Warpaint completed the acquisition of Retra Holdings Limited, a UK colour cosmetics business with a significant focus on the gifting market, principally for high street retailers and supermarkets including Boots, Superdrug and Asda. Retra owns three major brands: Technic, Body Collection and Man’stuff, in addition to supplying white label cosmetics produced for several major high street retailers including Asda and Matalan. Key VectorVest metrics first highlighted flagged up W7L potential in late April when the RT (Relative Timing) metric first broke above 1, providing early indication of more to come from the steadily rising share price. (RT is a fast, smart, accurate indicator of a stock’s price trend). Today at 235p the W7L RT metric still logs a rating of 1.42, which is excellent on a scale of 0.00 – 2.00. Other high scoring metrics include a GRT (Earnings Growth Rate) of 24%, which VectorVest also considers excellent. Although clearly on an upward trajectory, VectorVest still sees more to come, with a valuation of 279p. A weekly chart of W7L.L is shown above in my normal format. Over the past year the share has been revalued as shown by the green line study in the price window. The share is on a Buy recommendation on VectorVest and since the low point in September 2017 has charted several rising lows which is bullish price action. 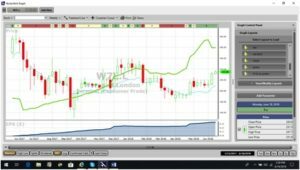 The initial target from what is known as a “measured move” in technical analysis is similar to the VectorVest valuation at approximately 280p. Summary: Fundamentally W7L ticks all the boxes for a niche growth stock, with strong trading continuing all the way from the results statement to the AGM this month. A RS (Relative Safety) rating of 0.88 may deter less adventurous investors, but with a raft of solid fundamentals supported by a bullish charting configuration, VectorVest rates W7L as an exciting growth prospect. Buy. Readers can examine trading opportunities on W7L and a host of other similar stocks for a single payment of £5.95. This gives access to the VectorVest Risk Free 30-day trial, where members enjoy unlimited access to VectorVest UK & U.S., plus VectorVest University for on-demand strategies and training. Link here to view.